Greetings To You, tales of music coming from the foggy coast. 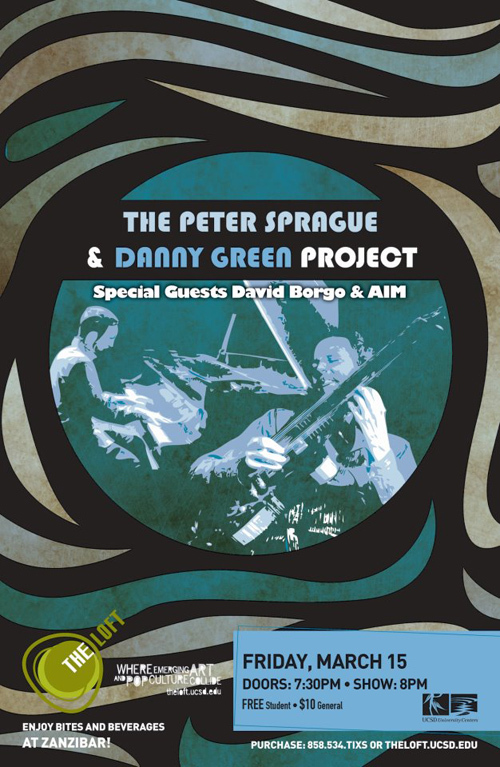 I’m spinning early as the story from SpragueLand will be a lengthy run today, churning out atonal hits from composer and saxophonist David Borgo. He has me navigating some rhythmic trickery and I’ve got my metronome and calculator ready to roll. 13/4 anyone? The Roxy Revolution is in full regalia! Last week we had a great solo night plus Kevyn and I did a special weekend hit. The place was packed and the vibe was good. I’m doing it again tomorrow eve and it’ll be the first set solo blending into a second set with a few guests added into the mix. See you there! The Roxy setup last week! 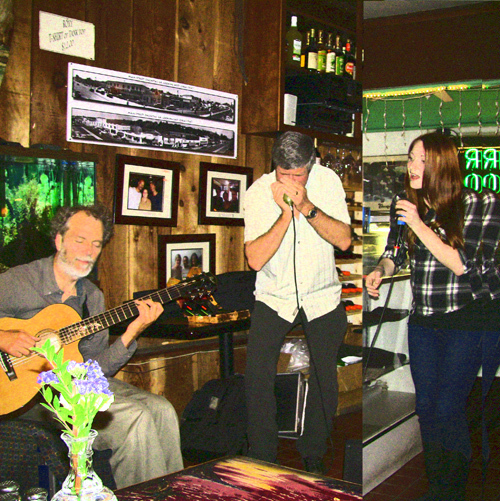 Joining me for the last set was “Harmonica” Johnny Minchin and Tiffany on vocals. Bending the rules by a little in downtown Encinitas. For Friday night we’re fine tuning Danny Green’s music along with some of my samba songs for an evening at The Loft at UCSD. We’ve got Julien Cantelm on drums and Gunnar Biggs on bass and judging from the rehearsal, we’re in good shape for a concert. Opening up the show will be David Borgo’s student ensemble. If you haven’t attended a Loft show, give it a whirl. It’s a really nice spot for live music. Last up for this week, on Saturday night we’re playing a concert at Dizzy’s. 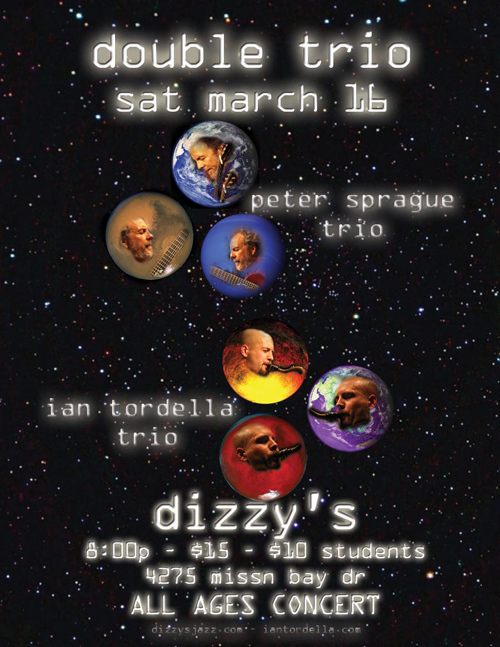 Ian Tordella’s Trio opens up the show, followed by my trio, and then at the very end, we all play together for a tune. I can’t wait to hear that! Semi-educated chaos—2 drummers, 2 bassists, plus Ian and I all at once. It’ll be a hoot! Here’s a little clip from a trio night we had at the Calypso last summer. Duncan has a smile and a really nice groove! This week we’ve added my composition “Zen Joao” into the setlist for the Loft concert and this got me thinking about sharing the song’s back story. The Brazilian guitarist and vocalist Joao Bosco has been a major influence and source of inspiration for me and I wrote this tune for him. I was inspired by one of his cool guitar comping patterns and I used this as a launching pad for the tune. From there we head to the bridge and here I explore a Coltrane-esque set of chord changes to stir things up. Joao plays with a fire and intensity and his singing is rhythmic and punctuated. You’ve got to check him out! We recorded “Zen Joao” a couple years back on the Taking It All In sessions and it’s great to revisit the track and the tune. Check it out.